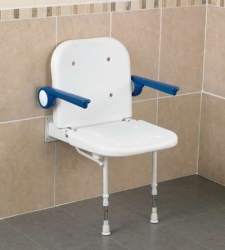 Wall Mounted Bariatric Shower Seat With Back Support. 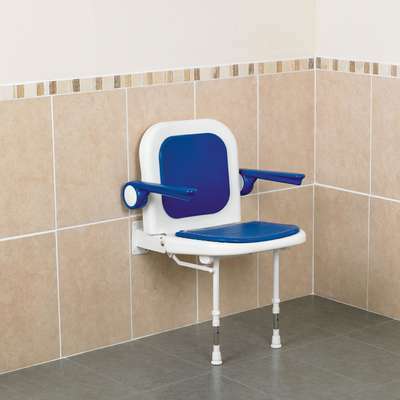 This generously sized shower seat features a comfortable back support that is angled ten degrees from the vertical for additional support and comfort. The drop down arms are coated with polyurethane foam and have moulded hand grips giving comfort and security. Two pairs of legs are supplied allowing the height of the seat to be adjusted anywhere between 390mm and 640mm (15¼" and 25˝). The padded version has removable seat and back pads made from polyurethane foam which does not absorb water even when cut or damaged.